Polotsk is the most ancient city on Belarusan territory and, according to Scandinavian legends, where it is called "Paltes juborg", one of the most ancient cities of the eastern Slavs. Excavations have proven the existence of a settlement there as early as in the 5th century AD. Polotsk was first mentioned in the chronicles of 862 as a town founded by the Slavic tribe Kryvicy-Palacane (the Kryvicy being one of the largest groups of Eastern Slavs who moved into the area in the 6th century AD) and as the centre of the Polotsk principality, a powerful, Eastern Slavic state which lasted from the 9th - 12th century AD. Other major cities were Viciebsk, Orsa, Miensk (Minsk) and Druck. Traces dating from this heathen times can still be found today, such as stone idols and huge stones which were used as sacrificial stones. In the 12th century the prince of Polotsk Barys had Christian crosses chiseled into these stones. 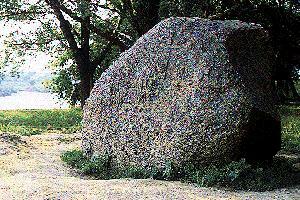 Since then they have been called "Barys stones". European maps dating from the 10th century already show the Polotsk principality as a separate state. The first states of the territory of today's Belarus were the principalities of Polotsk and Turau. Ruled from Kiev toward the end of the 10th century, they asserted thems elves early on as independent or semi-independent dominions. This was especially true for Polotsk. This period of time, when these principalities became independent, can be regarded as the beginnings of Belarus as a nation. The dynasty ruling Polotsk (starting with prince Rahvalod in 980) pursued a policy aimed at securing Polotsk's independence and making it the most powerful principality amongst the Eastern Slavs. Rahvalod and his sons were killed by Vladimir, the prince of Kiev and future christianiser of the Kievan Rus'. Rahvalod's daughter Rahnieda was forced to marry Vladzimir (see also The Story of Princess Rahnieda). Rahnieda's son Iziaslau was the only one to continue the line of his grandfather Rahvalod. After the Iziaslau's premature death in 1001, Polotsk was successfully ruled by Iziaslau's son, Bracyslau (1044) and grandson, Usiaslau the Magician, as he was called. Under Usiaslau the Magician Polotsk achieved its greatest power. With changing fortunes it fought against Kiev and Novgorod (a city North of Polotsk, a centre of a Slovene tribe - A.S.) and succeeded in expanding its territory to the South into areas inhabited by the related Dryhavicy tribe as well as to the West along the Dzvina river, far away from Polotsk's tributaries. Usiaslau ruled for a long time (1044-1101) and many of his deeds, in particular his determined struggle against Kiev, made such an impression on his contemporaries that they refused to take him for an ordinary mortal. Thus the contemporary Kievan chronicle ascribes his birth to magic: "In that year Bracyslau died ... and his son Usiaslau, born to his mother by means of sorcery, sat on the throne. When he was born there was a mark on his head and the wizards told his mother: 'Put a band round his mark and let him wear it all his life'. Thus Usiaslau has worn it to the present day. That is why he is merciless when it comes to the shedding of blood." Almost a century later the author of "Lay of Igor's Campaign" (one of the first works of Eastern Slavic literature - A.S.) gave the following description of Usiaslau: "Prince Usiaslau judged the people, granted cities to the princes, but at night he prowled about in the guise of a wolf. He would race from Kiev to Tmutarakan' (a town and principality on the peninsula between the Black Sea and the Sea of Azov, East of Crimea - A.S.) before the first cockcrow and, in the shape of a wolf, would cross the path of the great Chors. For him the bells of the cathedral of the Holy Wisdom at Polotsk would toll for matins in the early morning, and he heard them by the time he reached Kiev." 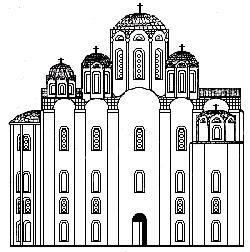 To crown the achievements of his father and assert himself as equal to the other princes, Usiaslau ordered the construction of St. Sophia's Cathedral (Safijski Sabor) in Polotsk, which should match the cathedrals in Kiev and Novgorod built in 1037 and 1050 respectively. The building, erected between 1044 and 1066 on the basis of Byzantine traditions, demonstrated originality in its architecture. St. Sophia's Cathedral was the first monumental building on the territory of Belarus. Its significance was enormous: not only did it help christianising the Kryvicy and neighbouring tribes, but it also became a symbol emphasising the independence of the Polotsk principality and of its traditional architecture and culture in general (at that time only Kiev and Novgorod had stone-built cathedrals) and underlining its role as an important strategic location on the route from Scandinavia to Byzantium. 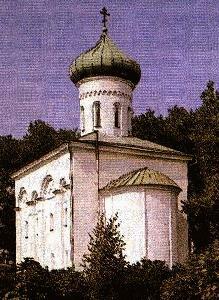 In the 12th and 13th century Polotsk was governed through a vecha system. The vecha was a body where all free male adult inhabitants of the city were represented. The vecha dealt with questions of war or peace, legislative questions and the conclusion of treaties. The vecha could also appoint and depose princes, select certain officials and try cases of political and other crimes. Votes were taken by acclamation. In the 12th century juweller Lazar Bohsa created the famous Cross of St. Efrasinnia of Polotsk (Efrasinnia Polackaja) (see also St. Efrasinnia of Polotsk - the first Belarusan saint and the first Slavic woman to be canonised by the Ortodox Church). In the 12-16 centuries Polotsk had the most ancient library in Belarus': the library of the Cathedral, for which Efrasinnia Polackaja herself copied many books. 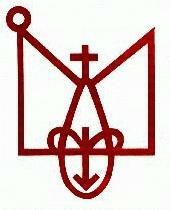 In the early 13th century the Order of Christian Warriors (Teutonic Order) and the order of the Knights of the Cross (also known as the Livonian Order) were founded in the lower reaches of the Dzvina. Their aim was to conquer new territories in Eastern Europe. Polotsk, together with the Baltic tribes of Lives and Lattgals fought a long battle with both orders (later with the Teutonic Order) for control of the lower reaches of the Dzvina and for access to the Baltic Sea. In 1307 Polotsk became part of the Grand Duchy of Litva and remained its most significant city until the 16th century. One of the signs confirming this is the Polotsk Code of Law, a system of legal standards and feudal statutes which was effective in the city itself and the surrounding territory. 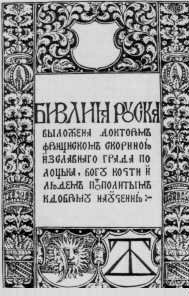 This code of law guaranteed Polotsk's independence not only as far as life in the city was concerned but also in its relations with other countries. 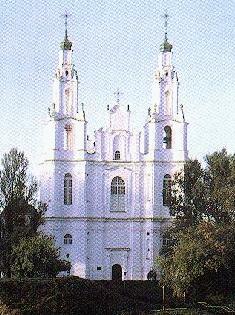 It was effective up to the late 18th century, when Polotsk became part of the Russian Empire. The "Polish Chronicle" mentions Polotsk in the year 1382 as the fortress of Bielaja Rus'. Around the year 1490 a great representative of the Renaissance was born in Polotsk: Francisk (Francisak) Skaryna, a great scholar and Doctor of Medicine at the University of Padua (Italy). He founded the first Belarusan publishing house (in Prague), where he commented and edited 23 books in Belarusan, including the Bible (at the time this was the first edition of the Bible in a Slavonic language and the second one in Europe). In 1498 Polotsk was granted the Magdeburg Code of Law (concerning municipal self-government). From 1563 - 1579, during the Livonian War (when Russia fought against the Livonian Order, GDL, Poland and Sweden for access to the Baltic Sea) Polotsk was occupied by the troops of the Muscovy Tsar Ivan IV Grosny (Ivan the Terrible). Over the wartime years, the library of the St. Sophia's Cathedral, where chronicles, books and other documents of Belarusan culture covering Polotsk's entire history were kept, was completely plundered. In 1579 the city was liberated by the Grand Duke of Litva and King of Poland Stefan Batory (Istvan Bathory in Hungarian). 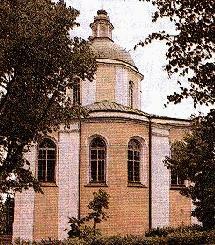 In 1581 the Polotsk Jesuit College, a secondary school (later, in 1812 it became an academy) was founded. In the 17th century the city was characterised by its large number of stone-built monasteries and churches, both Orthodox and Catholic. During the war between Russia and the GDL and Poland in 1654-67 Polotsk was again occupied by Russian troops. The city was severely affected by this terrible war waged by Moscow over "primordial Russian territory", as it claimed. The number of families in Polotsk decreased from 1500 to 102 (by 93%!!!) and the population in the Polotsk area shrunk from 163,000 to 40,000 (by 75%). The next war waged by Russia, this time with Sweden, was also fought on Belarusan territory. When the Russian Tsar Peter the Great (a supporter of a European Russia and the founder of St. Petersburg) came to Polotsk, he turned the most ancient Belarusan cathedral, St. Sophia �s Cathedral into an armoury. When the Russians left the city on 1 May 1710 they blew the armoury up and the cathedral was reduced to ruins. In 1738-50 the cathedral was rebuilt in the Vilnia (Vilnius) baroque style and this is what it still looks like. After the first division of the Rec Paspalitaja (Polish spelling Rzecz Pospolita), the state comprising Poland and the GDL, in 1771, the right-bank part of town was lost to the Russian Empire, the left bank followed in 1793. In 1820 the Tsarist authorities qualified the Polotsk Jesuit Academy and Polotsk's printing workshop as "suspicious". The Academy's library, which contained 40,000 books and was the richest collection of 16th-18th century books, was disbanded, the books were taken to St. Petersburg, Kiev and other cities. The official state church in the GDL since 1596 was the so-called Uniat Church. It was formed to resist the Polish catholicisation and the Russian Orthodox faith and played a unifying role for the Belarusan (as well as the Ukrainian) people. Church rituals continued to be conducted in the Orthodox way, but in contrast to the Orthodox Church, the Uniats recognised the Pope as their head. However, in 1839 the Polotsk Church Council passed a resolution which forced the Uniat Church to merge with the Orthodox church and outlawed the use of the Belarusan language in church service. In our century Polotsk became a district centre within the Viciebsk region. Its old town has been declared a monument of national heritage, a part from this it has a museum of Belarusan bookprinting, a museum and library named after Simiaon of Polotsk, a 17th century Belarusan and Russian writer, the Polotsk Picture Gallery and Polotsk University, founded in 1993.